Would you kmow when you may hit Federal Drive? Unfortunately we do not have an exact time for Santa's visit to Federal Drive. Just listen for the sirens. Two toddler boys obsessed with fire trucks on Foothill Drive would love to see you this year! We missed you last year. Any updates on Santa’s location?? When will he come to Stargazer Village?? Thanks for coming by this morning Santa! 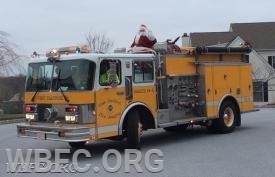 It is always such a great treat to have you visit with the fire company each year. Thank you to all the fire fighters and 1st responders for helping to keep us safe.